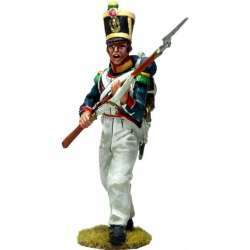 Line infantry There are 117 products. Painted 1/30th scale figure.It belongs to the Napoleonic periodReference NP 658 Swiss infantry Neufchatel battalion NCOModeled, cast and painted in our workshop. Painted 1/30th scale figure.It belongs to the Napoleonic periodReference NP 643 French line infantry 2nd swiss regiment privateModeled, cast and painted in our workshop. Painted 1/30th scale figure.It belongs to the Napoleonic periodReference NP 642 French line infantry 2nd swiss regiment NCOModeled, cast and painted in our workshop. Painted 1/30th scale figure.It belongs to the Napoleonic periodReference NP 628 French line artilleriman with portfireModeled, cast and painted in our workshop. Painted 1/30th scale figure.It belongs to the Napoleonic periodReference NP 619 French line artilleryman 3Modeled, cast and painted in our workshop. Painted 1/30th scale figure.It belongs to the Napoleonic periodReference NP 589 French line infantry voltigeurs 1815 12Modeled, cast and painted in our workshop. Painted 1/30th scale figure.It belongs to the Napoleonic periodReference NP 588 French line infantry voltigeurs 1815 11Modeled, cast and painted in our workshop.